A Touch of Black - Columbia Builders, Inc.
No design choice can do so much to your room aesthetic with so little effort than adding a touch of black! Professional designers and amateur decorators agree that there is one key ingredient essential to the success of a room’s overall feel and décor – a touch of black. A timeless accent that goes with everything, black is always in style and adds sophistication like no other color can. Just like black is the go-to in fashion, savvy home design enthusiasts make use of the color to pull together the elements of a room. A simple touch is all that is needed, making its addition easy on every budget, and nothing will add so much to your décor with so little effort. Here are a few ideas to inspire you! What can compare to the enduring duo of black and white? Floor tile, fabrics, and accessories in this combination are a sure bet in any room of your home. Want to add a modern twist? Pair black and white with a vibrant hue! A bright punch of color such as lime green, fuchsia or even classic red added to a black and white motif will transform a dull laundry room, high-traffic powder room, or contemporary bedroom into a space full of life and fun! A black accent wall, especially in a white or neutral space, will provide the spark for the rest of your décor. Is it any wonder why the tuxedo kitchen gained popularity? Black is simply a stand-out, setting the stage for contrast and interest. And don’t forget about your room’s fifth wall – the ceiling. A confident and bold choice, a black ceiling will be the defining element of your space, be it modern and chic or opulent and refined. This option is best for those who are comfortable with their design abilities or those consulting with a professional. Create character and depth by painting the interior or exterior trim of your home black. Designers favor pairing a very light backdrop with black to create a sharp, clean aesthetic that is never boring. Consider using it to accentuate the lines of your home’s exterior or create classic distinction by painting your interior door and window trim, or even the railings of your staircase. 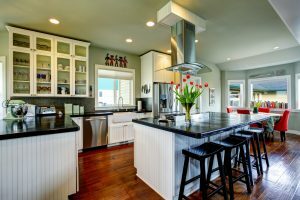 If you’re not quite sold on the permanence of black paint, cabinetry, or flooring in your home, you can still achieve the color’s many benefits with carefully placed accessories in your décor. From textiles such as pillows, draperies, and area rugs to artwork featuring a prominence of black, to lampshades and furniture, and even black pottery displayed in your kitchen – the possibilities are nearly endless! This entry was posted on Friday, August 10th, 2018 at 11:37 am. Both comments and pings are currently closed.